XML Schema Definition well known as XSD is a way of describing the XML language precisely. XSDs will check the validity of structure and vocabulary of an XML document against grammatical rules of the suitable XML language. This tutorial will explain you the basics of XSD and all the basic components of XSD with appropriate examples. 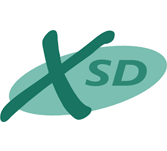 This tutorial is useful for beginners which will help them in understanding the basic concepts of XSD. With help of this tutorial, you can take yourself from a beginner level to a higher level of expertise.